Sweets have to be my weakness. As much as I want to say trying to eat better and exercise has been a peach, it's hard and it takes lots of dedication to stay focus and on track. Earlier this week I had a sweet tooth badly, so I decided to hop on that Cake In A Mug wagon and make one. What I love about these is that I can whip it up in less than five minutes for a quick snack and although it may not be the healthiest snack to eat, it's portioned controlled so I don't go overboard and eat an entire cake, instead I have one serving and that's not too bad. Hey, we're allowed to treat ourselves every once in a while, right?! There were so many to choose from, but I decided I'd go for something I love and hadn't had in a long while, coffee cake. 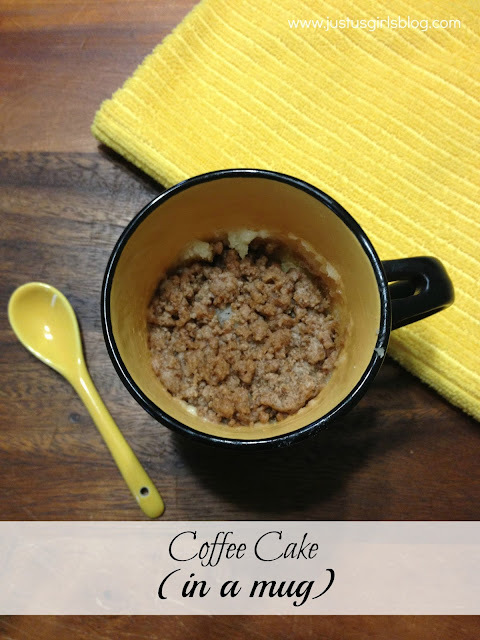 Coffee cake is delicious and perfect, especially since lately we've been having constant rainy days. I had all the ingredients in my pantry and it literally took me a few minutes including mixing everything together and nuking it in the microwave. It came out delicious, warm and took care of that sweet tooth I had. Get ready for some more cake in a mug recipes coming soon, I made the kids a couple of them for after school treats as well! In a mug soften 1 tbsp of butter in microwave, about 5 seconds. Unless it's been in the fridge, in that case 10-15 seconds depending on how hot your microwave gets. You don’t want it melted, just soft. Stir in 2 tbsp of sugar and mix until well incorporated. Add in applesauce and a drop or two of vanilla, stir well. Next add in your flour, baking powder, and pinch of salt and stir until it is combined well. In a separate, bowl, combine 1 tbsp of butter, 2 tbsp of flour, 1 tbsp of brown sugar, and 1/4 tsp cinnamon. Use a fork or your fingers to to pinch the butter and mix it in with the other ingredients. Mix together well until it is all combined and then pour on top of cake batter in mug. Cook in the microwave for 50-80 seconds depending on your microwave. It will look just barely set on top. You don’t want to overcook it. I suggest cooking it 60 seconds, and then in 10 second intervals checking after each interval until done. Eat while warm and enjoy!